Open housing was one of the most prominent goals of the Seattle, Washington civil rights movement in the 1960s. Up to the early 1960s African Americans in Seattle were almost completely restricted to housing in the Central District of the city. Housing restrictions were not based on laws but were socially enforced by both homeowners and real estate agents through racially restrictive housing covenants and in some cases violence and intimidation. In 1961 Seattle blacks lost the legal basis to challenge residential discrimination when the Washington State Supreme Court ruled in O’Meara v. WSBAD (Washington State Board against Discrimination) that the 1957 Washington Civil Rights Act did not apply to real estate transactions involving Federal Housing Authority (FHA) loans. Since the vast majority of loans were FHA guaranteed, the ruling effectively eliminated legal protection from racial discrimination in housing transactions. Much of the Seattle African American community now united behind the Central Area Civil Rights Committee (CACRC) to challenge housing and other types of discrimination. Inspired by the tactics of Southern protesters, a new militant group of activists embraced those tactics for Seattle. Reverend Mance Jackson, minister of the Bethel Christian Methodist Episcopal Church was a part of this new local group. Jackson was one of many activists frustrated with the slow, quiet attempts by some more liberal Seattleites to relocate blacks outside of the Central District. He and others saw public civil disobedience as a faster means to achieving their goals. 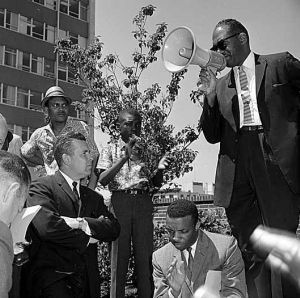 In 1962 Seattle Mayor Gordon Clinton and his Committee on Minority Housing recommended a fair housing ordinance and it appeared the issue was finally getting more attention. However nearly a year later the Mayor and city council had failed to take any action so on July 1st, 1963 Rev. Mance Jackson, along with Rev. Samuel McKinney, led a 400 person protest march from Mt. Zion Baptist Church (in the Central District) to City Hall. The march was followed by Seattle’s first sit-in, in which several young protesters took over the Mayor’s office for nearly 24 hours. On August 28th, 1963 Jackson helped lead a 1,000 person march from First AME Church to the Federal courthouse in protest of the city council’s failure to take action. The demonstrations continued until the fall of 1963 and unfortunately had the effect of polarizing the city along racial lines–many who had been ambivalent were now against open housing because of the movement’s more radical image. On October 20, 1963 the city council finally enacted an open housing ordinance; however opponents had it placed as a measure on the ballot for the March 10th, 1964 election and it was voted down by more than a 2-1 margin. An open housing measure was not adopted until four years later. In 1968, Rev. Jackson left Seattle and moved to Atlanta, Georgia where he joined the Interdenominational Theological Center of the Christian Methodist Episcopal (CME) Church. Rev. Mance Jackson died in Decatur, Georgia on March 16, 2007. Quintard Taylor, The Forging of a Black Community: Seattle’s Central District from 1870 through the Civil Rights Era (United States of America: University of Washington Press, 2003); http://seattlepi.nwsource.com/lifestyle/59696_blackhistory26.shtml.